Lisbon really surprised me. Everything I read made me feel like Porto was the true star of the Portugal cities, and that the Algarve would be the winner of my heart. And while both of them swept me right off my feet, Lisbon sparkled in its own right. The architecture really stood out to me, and since to much of the city was rebuilt after the earthquake of 1755 it really gives the city it's own personality. So many of the buildings felt like art to me. I'm pretty sure Andrew would say I could spend weeks just walking around snapping picks of the all facades (he's right). 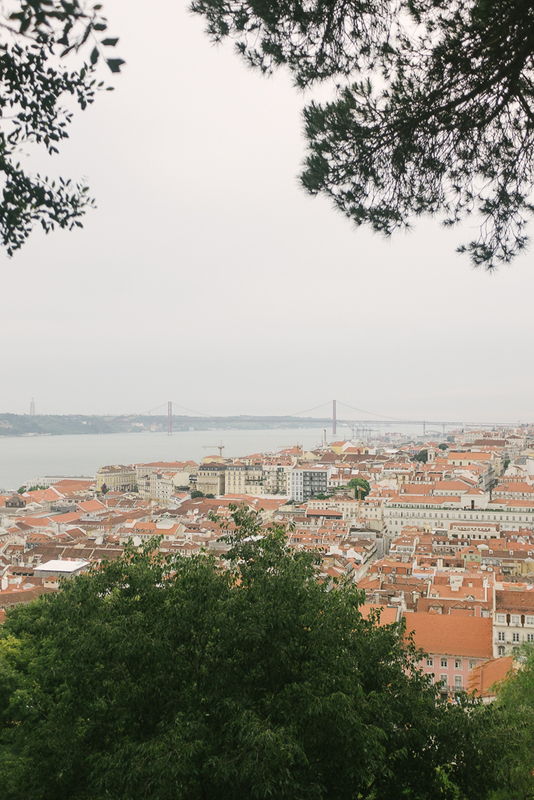 We only had a day and a half in Lisbon, so we really had to hit the ground running. We saw so much in one day, I think people thought we were crazy when we told them. My phone said we walked 9 miles and 41 floors. That's no joke. But it was so worth it. I only wish we could do another day to see the things we missed! Our tip would be to really map out what you want to see to make sure you see them efficiently, so many of these are right next to each other! Beautiful vistas and history, try to go when the tide is high so you can get a real feeling of how it was way back when it was actually an island. This stately statue for the age of exploration, it's close to the tower and monastery, so make sure to do these all together. This beautiful monastery is a must see. Get a ticket at the tower of Belem prior to coming, though, it will help you avoid some serious lines. We almost didn't make the trip to this castle, but it ended up being our favorite stop. Grab a glass of wine and watch the sun go down over the tower walls or watch the peacocks put on a show - it's a special little place. This beautiful square was just steps from our hotel, and our uber driver told us it's the largest square in Europe! This little charming place doesn't take reservations (which is right up our alley...because we can never get our act together to make them on vacation), so prepare to wait a bit for a table (however they will happily serve you a few beverages while you do so!). It's worth it, the ever-changing menu and the tapas-style approach made for a memorable meal. Another amazing meal at another place that doesn't take reservations. That didn't bother us a bit, we had walked 10 miles on this particular day, so we just bellied up to the bar with a gin & tonic (a Portuguese speciality we've come to learn) while we waiting for our table. The food was totally worth the wait. The chef, Jose Avillez, is a really respected guy in these parts, and his restaurants explained why. Set on top of a parking garage, this is the perfect place to grab a cocktail and take in the gorgeous views. It's a tad hard to find considering you pull up to a legit parking garage, but just peek your head into the parking lot and find the elevator. Take it to floor 5, and then walk one more flight of stairs to the top floor. Then enjoy the views. You will see this pretty little place on every guide for Lisbon. I'm always hesitant to go to a place like this because crowds and hype just aren't my thing, but we decided we needed to see what all the buzz was about. And the second I bit into my pastéis de nata, I knew. They were easily the best we've had our entire trip (and Andrew did some serious research...). There are so many gorgeous spots to take in the views. Definitely check out MIRADOURO DAS PORTAS DO SOL, MIRADOURO DE SÃO PEDRO DE ALCÂNTARA, MIRADOURO DE SANTA LUZIA and ST. GEORGE'S CASTLE. We absolutely loved this hotel. There were so many little touches that really made the stay feel special. We were welcomed with a bottle of bubbly rosé and cake, which made me feel like they might have known Andrew and I personally. They also provided a phone filled with all the guides you would ever need, maps, etc. to make our Lisbon stay informed and convenient. It was an amazing little effort, and we ended up using that phone more than our own. I wish more hotels did this! My battery and data plan was very thankful. The rooms were large (our even had a kitchen) and well decorated (obviously important), and although we only had the change to eat breakfast at the hotel's restaurant, we've heard amazing things! The location is spectacular, we literally walked everywhere (and only ubered to the sites that were a good 15 miles away). The night before we left, they left gorgeous soaps as a departing gift (this area is know for them), and it almost felt like we were staying at someone's home with the best hostess ever.